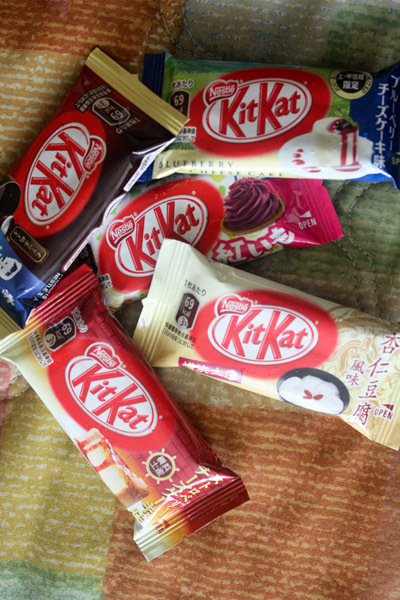 Holy Kit Kat, there are so many of you! After work, my dad and I had dinner in Metrowalk. I don’t enjoy going to here for personal reasons but Dad insisted so I said yes. 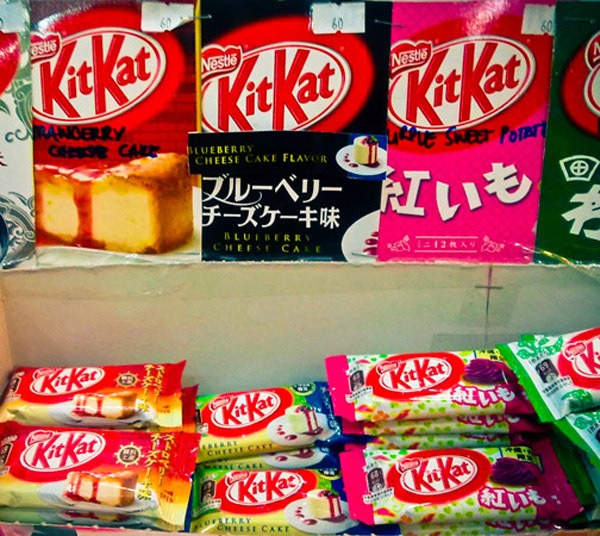 We went around the 2nd floor and I only checked out one stall – Subarashi which sells diverse Japanese products including an assortment of Kit Kat flavors. My Mom is a big fan of the original Kit Kat variant so we decided to take some home for her to try. These tiny Kit Kat bars retail for P60 each. 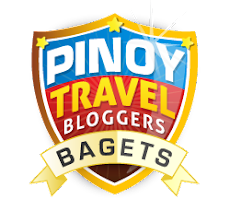 They have other sizes that are larger and more expensive. Haha Subarashi has over a dozen flavors in stock when we passed by but we decided to stick to 5 so we wouldn’t overwhelm ourselves. 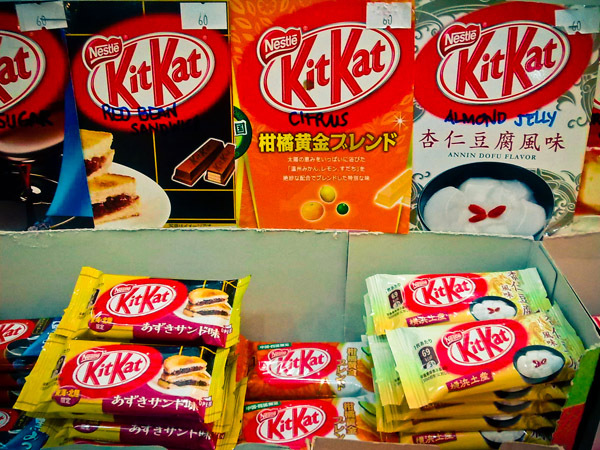 The Sweet Potato Kit Kat wasn’t as bad as I expected since I’m not a huge sweet potato fan. 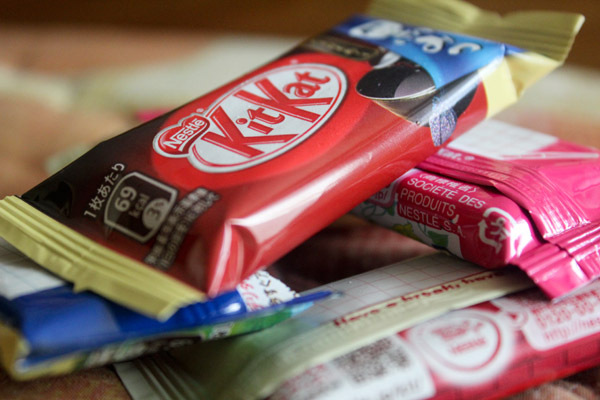 This bar isn’t as sweet as the typical Kit Kat. I was imagining how almond jelly would mix with milk chocolate but I was surprised to see that they used white chocolate for this. 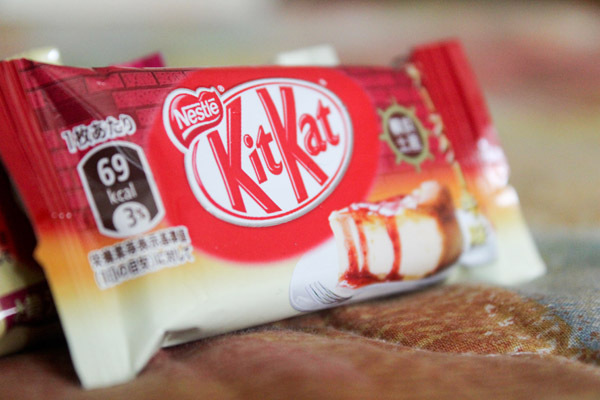 This Kit Kat flavor tastes good for a chocolate bar since it had the right hint almond jelly in it. However, this wafer bar lost its famous Kit Kat taste. The cheesecake taste was strong in this variant and had a distinguishing sour taste. The blueberry kicked in as an after taste. I was expecting the same sour taste from the Blueberry Cheesecake but it was nowhere to be found. 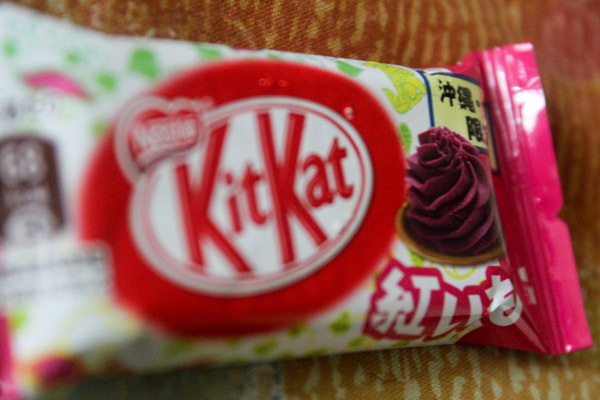 The Strawberry Cheesecake Kit Kat was sweeter than the blueberry and reminded me of the Dewberry cookie. What would mix well with brown sugar? I’d say milk chocolate! Alas it wasn’t the case – this was another white chocolate wafer bar. 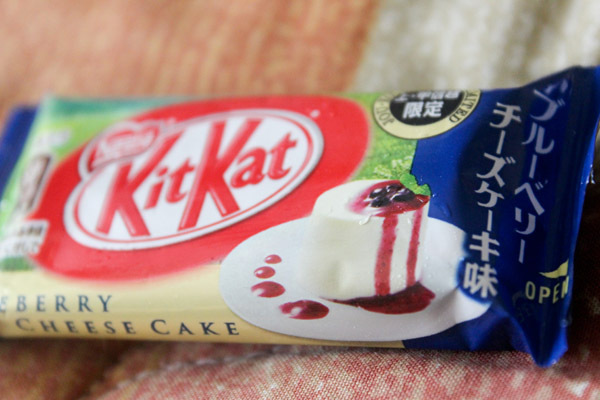 I expected this to be my favorite from the bunch but after tasting it, the Brown Sugar Kit Kat left me dumbfounded. It took a couple of seconds for me to process my feelings. Odd as it may seem the brown sugar seemed disconnected from the chocolate bar – it tasted like they shouldn’t go together. Hands down my favorite was the Strawberry Cheesecake. All the variants did not remind me of the original kind at all. In my experience even with the permutations of Reese’s I tried, nothing beats the original. 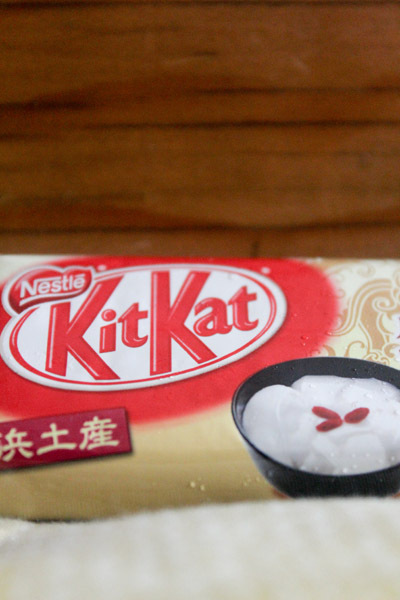 It might be safe to say that this holds truth to other chocolates too because even though it was fun trying out the other types of Kit Kat, I’d still choose the original version. a student of mine gave me kitkat hazelnut. 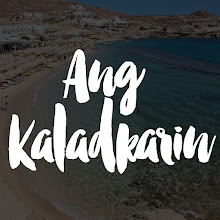 it almost tasted like the original, super slight diff lang. that's sad that the hazelnut taste was evident!